I'm helping a friend install a sink in a workshop that was added onto his house. 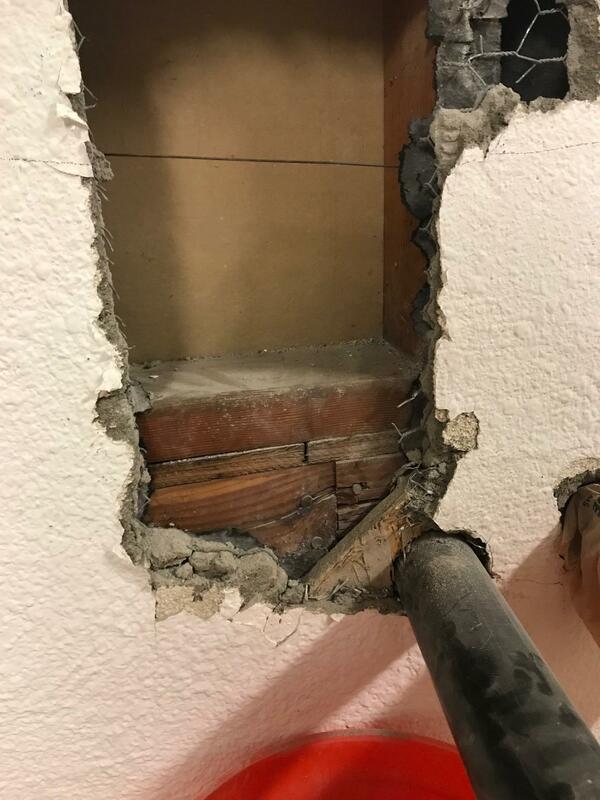 A previous owner installed a water line and a drain by boring through what appears to be the rim joist of the original house into the workshop but they did not vent it. I am reusing the holes they bored and want to vent the drain properly. My original plan was to install an AAV in the wall above the drain but after removing some of the stucco, it appears there is a stud directly above the drain pipe. The stud cavity to the right does not have enough room to fit the AAV box I picked out. I opened the stud cavity to the left and found that the drain goes through the end of the rim joist and has a sizeable amount of sill plate and framing above it. I am worried about notching/drilling through this part of the framing to accommodate a vent pipe. Notch/drill through the sill plate and remaining part of the rim joist to install the vent pipe/AAV + box in the left stud cavity. Install the AAV in front of the wall. Is this even legal? Install the AAV in the crawlspace behind the wall. This would almost certainly be at a height below the P-trap its venting and several feet away. Would this still be effective? Option 1 is fine. There's nothing load-bearing about the rim and plate at that location. I'd bring the wye up at 22-1/2 from plumb to move away from the stud. An AAV can be installed as long as it is 4" above the trap. Just add a vertical to that run and put the AAV above the line. That would be your easiest solution anyway. Otherwise, as Isherwood points out you could add a vent to the run but that looks like a lot of work for what it's worth. Not the answer you're looking for? Browse other questions tagged plumbing drain or ask your own question. How can I repair an air conditioner drain line that is broken flush with the wall? Can I tie a vanity sink drain into the bathtub drain?